I made two more shirts, from patterns I previously used. This another design from the McCall’s Brooke Shield’s Signature Collection. I used the same pattern, but made sure I cut enough fabric for the shirt. Since it’s a kids pattern, I had to make some educated guesses for my size. I added a half inch to each middle seam, then one inch to all outside seams, and for the bottom I added four inches. Also made notes on the pattern. The tricky part was making sure the collar/interfacing was the correct size. Because the seam up the middle, I had to add one inch to the middle of each facing piece. Then I went to sew up the middle seams and thought I’d be a genius and make sure the shirt had enough room, sewed them at 3/8 instead of 5/8 (like the instructions say). 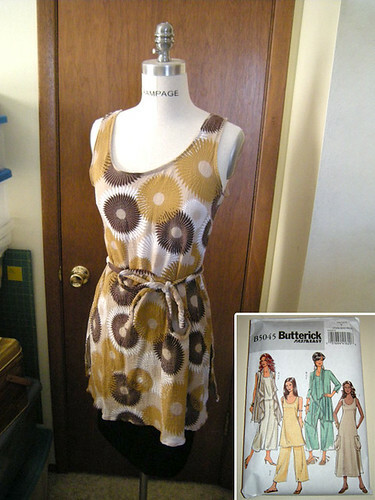 Then I realized that to make sure the facing fit correctly that I’d have to go back and sew those seams again, at 5/8. My mom and I had a blast picking out fabrics. We dug deep into her quilting extras to find all four fabrics to match. We had even more fun picking out buttons (see previous post!). I ended up choosing two different buttons, two of one and one of another. They all have a leather look to them, they match the shirt very well. 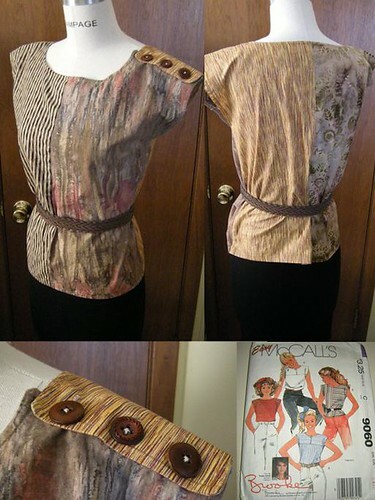 This shirt sewed with pretty much no complications, and this time, I didn’t have to add any fabric to the sides. I’m calling this one the Machine Hippie, because the fabric reminds me of machine/robot parts. Those are… Ok, I just consulted my Dad and he said they are called “gears” – you know, the round things with the divots around the outside. Anyways, this time around, this pattern was much easier. On the red/black one, I made my own bias tape, this time I bought matching tan bias tape. For fun, I used a zig-zag stitch around all the outside seams. It gives it just that extra pizzaz. Anyone else ready to tackle the Swim Suit?!?! I’ve got some 80’s patterns calling my name. And some fantastic fabrics to match.